Don the hard hats and watch out for falling debris! Catering to our love of all things bleak, industrial and construction site flavoured, Blackest Ever Black and BleeD have just announced the inaugural edition of a new night in London. Called Before My Eyes, the first event will take place at Stoke Newington's Waiting Room (nee The Drop) on April 12th, and looks likely to feature the sort of dark and stern sounds that the label's become renowned for. As well as featuring selections from Blackest Ever Black's Kiran Sande - expect industrial, post-punk, techno and obscure jungle 12"s - the night also finds Modern Love's purveyors of spooked dub Demdike Stare and excellent BEB duo Raime taking to the decks for an extended vinyl-only session. 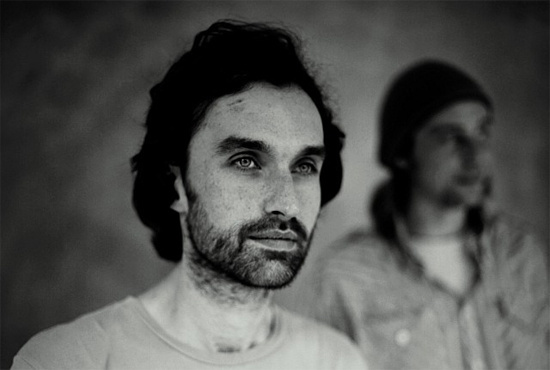 As well as being involved in numerous other solo and collaborative musical ventures, Demdike's Miles Whittaker has also long been known for his DJing, with his sets as MLZ having drawn together genres from across the board long before the digitally-assisted current trend towards eclectic DJing began. "I used to get booked quite a lot under my MLZ moniker and I'd just turn up and play everything, you know – and people would be like 'what is he doing? '," remembered Whittaker when we interviewed him in 2010. "But it's still there: I'm referencing techno by playing a garage track, because it's still got 303s, or something. You just think, 'look, everything's the same, it's all music!' ... You can't be too extreme with people, but you can subtly nudge them into another area. And if I could have one goal, it would be that every time somebody listens to our music they get interested in something they weren't interested in before." With that in mind, it promises to be an excellent and ear-opening evening. Tickets are £4.00 in advance and available here. It's a tiny venue so grabbing one in advance is probably a good idea.